Flip Out Mama: Hot Gift! Max and the Magic Marker for DS! Well, it is no secret that around here we love our DS Games. After last year's horrifying loss of Tater's DSi (thrown in the toilet by his then-one-year-old brother! ), we have thoroughly recovered thanks to Nintendo's wonderful 3DS. The capability of the 3DS to play both 3DS and original DS games has been a lifesaver to us, and we are happy to be able to tell you about another great new game! Max and the Magic Marker tells the story of Max, an adventurous young boy who receives a mysterious marker pen in the mail. Playing around with it, he discovers that whatever he draws comes to life and the stage is set for a classic platform adventure romp. The player controls Max using the DS stylus, as well as the magic marker itself, as he hops and jumps through a series of levels using the marker’s fabulous powers to draw objects directly into the game world and to solve a wide range of puzzles in his efforts to catch the monster he created using his magic marker. First of all, Max is super cute! IGN actually describes him as looking like a young Conan O'Brien, which is perfect! Max receives a real life MAGIC magic marker, and makes a big mistake when he draws a monster, who then becomes real and invades all his drawings! Now Max is on the case to catch the monster, and he has his magic marker with him for help! I love that this game allows you to "draw" your way out of sticky situations. I like that it takes a little bit of imagination and creativity to get through the game. It is so cool to be able to solve the puzzles on your own! This is a game that is perfect for Tater, as I really like to see a game that works his brain a little bit instead of the regular stuff.. I truly really like this game and I can't wait for more games like this to be on the market. I would totally recommend Max and the Magic Marker as a different and new kind of game that actually involves some logical thinking skills! 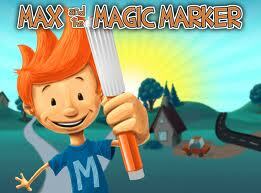 To purchase Max and The Magic Marker, click here! &lt;p&gt;&amp;amp;amp;lt;br&amp;amp;amp;gt;&lt;/p&gt; I received a sample product in order to conduct this review. Although a sample product was received, all opinions are my own and I received no monetary compensation.